Don't you just hate it when you lose grommets from your favorite tarp or when grommets become unusable on important items like your pool cover, tent or sleeping bag? If you kept a handy PTM tarp repair kit in your tool supplies you would never have to worry. 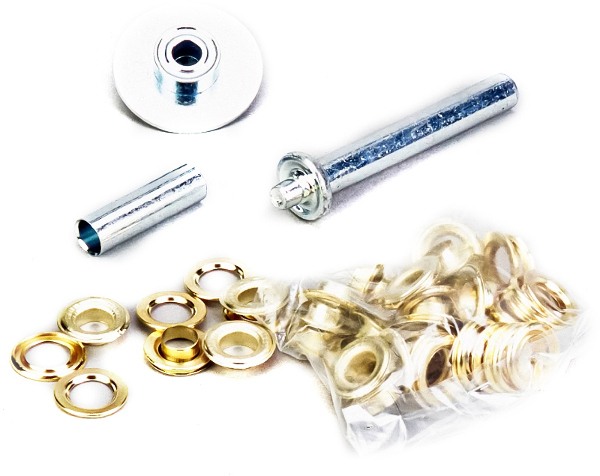 Each kit contains three zinc plated grommet punches to remove and install grommets easily. You will also have 50 pieces of 1/2" rust-proof brass coated grommets and 50 pieces 1/2" rust proof brass coated washers. You will be ready to make repairs any time they are needed with this generously packed kit. Do you carry Neoprene grommets for tarps to cover trucks? Unfortunately, we do not carry grommet covers.